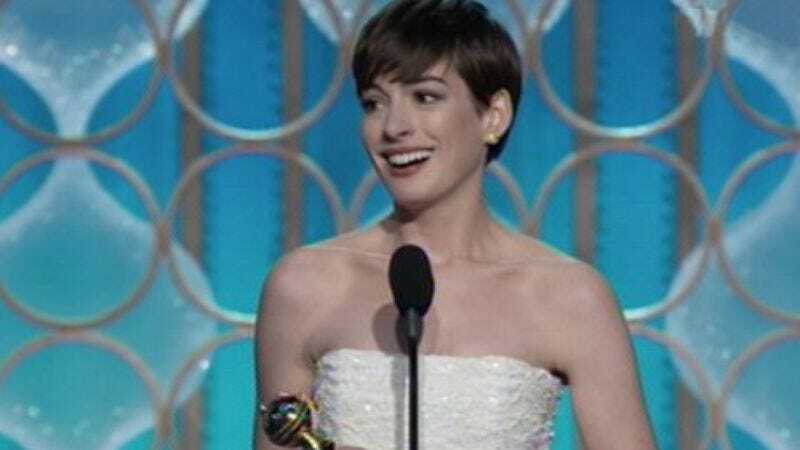 Following the effusive praise that Anne Hathaway’s performance in Les Miserables has produced in Anne Hathaway, Hollywood’s drama club director has decided that more classic literature should be filtered through Hathaway’s tremulous frame—this time Shakespeare’s The Taming Of The Shrew, that timeless tale of why ladies should shut it. The Wrap reports that Shame screenwriter Abi Morgan is developing a sort-of-modern-day take set in 20th-century Italy, with Hathaway on tap to be the woman whose exaggerated demeanor is so off-putting that it’s difficult to imagine anyone tolerating it, while also starring in Taming Of The Shrew. Hathaway has yet to comment officially on the project, likely as she is too busy standing around in the Hollywood hallway where the cast list was posted, pretending to be sooo nervous now oh my God in front of all the girls who didn’t get the part. They hate her.